A total of 5 matches were played today of the ongoing FIFA World Cup 2018 friendly matches. The Match wise highlights of all 5 matches are appended below. It was a match between Argentina and Haiti and it was the latter who was the favorite to win this match. This was admitted by Messi before the match. But, the audience saw a different story as Argentina managed to win the match against Haiti. It all started in the 1st half when Argentina were given a penalty and it was Lionel Messi who scored it and gave his team the first goal of the match. No other goals were scored by either side in the 1st half as it came to an end with Argentina in the lead by 1 – 0. After the break the 2nd half started as Haiti looked to make a comeback and level the scoreboard. 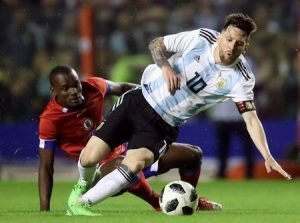 However, Argentina’s leading attacker, Messi didn’t allow it as he scored two more goals between 8 minutes to complete his hattrick. The score was now 4 – 0 and Haiti were now looking for a consoling goal. However, Argentina kept dominating the possession and so Haiti couldn’t muster up a single goal in the match. Northern Island started their match against Panama with three new players who made their debut for their country. The conditions in Panama City were tough and Northern Island would have to bring their A-game to win this match. The 1st half started as both teams were hoping to score the opening goal of the match. But, despite several tries at each other’s goal posts, neither Ireland nor Panama could net the ball as the 1st half came to an end. Although, Panama’s Edgar Joel came close to scoring but couldn’t do so as the final scores at the end of the 1st half were 0 – 0. The 2nd half went underway and a lot of substitutions were seen by each team as they looked to score a goal. Johnny Evans was Ireland’s skipper in the absence of Steven Davis, as the Irish looked to score under a new leader. 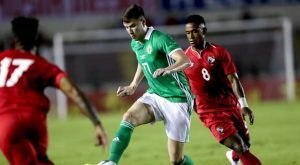 But, neither Ireland nor Panama could score in the 2nd half and with the final scores being 0 – 0, the match ended in a draw. Four new players were inserted in the Scotland line-up today, one of which being a goal-keeper named Jordan Archer. On the other hand, Scotland also gave a chance to three new players that played a huge part in winning them this match. In the 1st half, Peru looked dominant with the ball, however the Scottish defense was equally impressive. However, it was not long before the ball hit the elbow of McKenna and a clear penalty was awarded to Peru. Christian Cueva took the penalty shot and managed to score as the ball flew past the keeper’s arms and into the nets. Right after that another great chance was taken by Peru’s strikers but this time the ball was blocked by the goal-keeper. So, the first half came to an end with Peru comfortably in the lead with the scoreboard being 1 – 0. 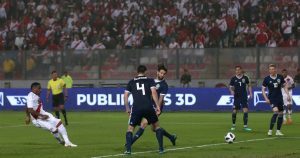 Now, the 2nd half went underway and with only 2 minutes into the 2nd half a blatant error by the Scottish keeper awarded Peru with another goal. This time it was Farfan who had managed to take advantage of the pressure on the debutant goal-keeper and snuck the ball through to make it 2 – 0. The Scottish were now battling to avoid an embarrassing score-line and they managed to do so as a testing 90 minutes for Scotland came to an end. 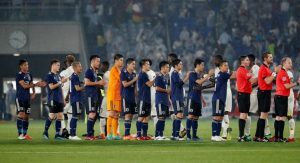 A new formation was played by Japan’s football team manager Akira Nishino but it didn’t stop Ghana as they won the match by 2 goals. On the other hand, Ghana who had failed to qualify for the World Cup weren’t shy to show their skills and win this match. Japan needed a goal to level the scoreboard but couldn’t do so as the first half came to end with Ghana firmly in the lead. After the break both teams came to the ground once more with Japan looking to score a goal and make it 1 – 1. However, Oshima was given a yellow card minutes into the 2nd half and Ghana were awarded a penalty. Emmanuel Boateng was the one who was given the penalty and he scored it to make the score 2 – 0. This score remained till the end of the match as Japan lost to Ghana in the end. Japan need to improve or they will have a tough time at the FIFA World Cup 2018 in Russia. The last match of the day was a tight one, however it was Austria who beat the FIFA World Cup 2018 hosts by 1 goal. The lead was taken by the Austrians in the 1st half and it proved valuable in the end. Alessandro Schopf’s 28th minute strike in the 1st half gave Austria the lead in the match. Russia couldn’t manage to score in the 1st or in the 2nd half as the hosts lost to Austria in a tight match. The Russian fans were disappointed but they would hope that Russia comes back on track and display their football skills in the nearing FIFA World Cup 2018. That is it for today. Do visit us tomorrow for more FIFA World Cup 2018, International Friendly Matches Highlights.